Two thousand years ago Barcelona was a mere pup compared to Colonia Iulia Urbs Triumphalis Tarraco, the proud capital of the Roman province of 'Nearer Spain', or Hispania Citerior. History has since taken Tarragona down a peg, but left it a gracious city of palms and well-worn ruins, set on a natural 320 ft rampart over the sea. Start on the Balcó del Mediterrani, with its cool sea breezes and statue of Roger de Llauria, who conquered Sicily for the crown of Aragón. Just behind begin Tarragona’s main promenades, the Rambla Vella and the parallel Rambla Nova, both decorated with Modernista buildings. Just behind the Balcó, north of the Rambla Vella, you can climb over the southern curve of the Roman Circus. Far as they were from the finish line, these weren’t really the cheap seats (and the curve seats would overlook most of the spectacular chariot crashes). Domitian, that most sporting of emperors, built the Circus in the 1st century AD. Adjoining the Circus is the 1st-century BC Praetorium, +34 977 22 17 36 (open Tues–Sat 9am-7pm, in summer until 9pm; Sun 9am–3pm; adm), known as the Castle of Pilate—like Seville, Tarragona liked to claim Pontius Pilate as a favourite son. The Praetorium is really a medieval palace built over a Roman one. In its day it hosted Augustus and Hadrian, and the Kings of Aragón before the French destroyed much of it in the siege of 1811, although one defense tower survives. Underground passages lead into the restored remains of the Circus. Next to the Praetorium, the Museu Arqueològic (+34 977 23 62 09, open June–Sept Tues–Sat 9.30am–8.30pm, Sun 10am–2pm; Oct–May Tues-Sat 9.30am–6pm, Sun 10am–2pm; adm) has an exceptional collection of everything Roman. There's plenty of sculpture and some rare mural paintings from the Roman houses; the exceptional mosaics include an entire seafood dinner. Tarragona’s Jewish quarter was in the back streets around the museum, in the narrow arched lanes around Pla Angels, where the synagogue once stood. 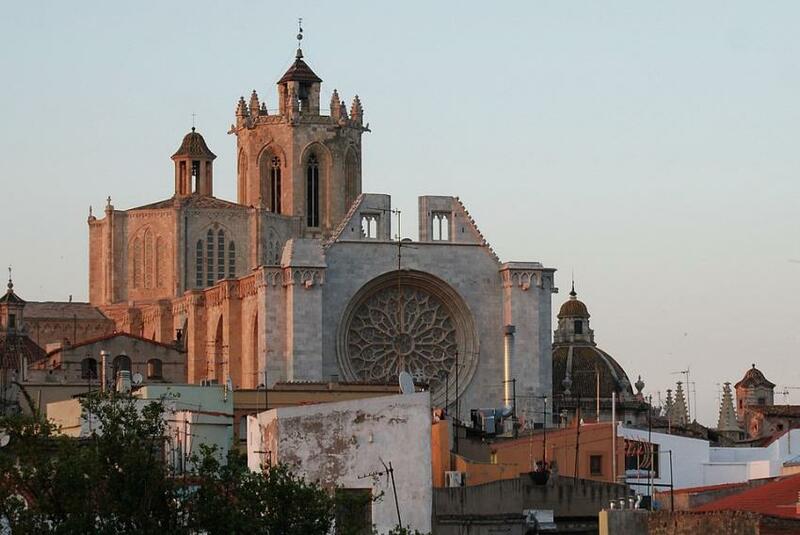 A stairway from C/Major ascends to Tarragona’s tremendous Cathedral of Santa Tecla, a masterpiece of the Transitional style, built over a temple to Augustus (+34 97 7226 935, open Mon–Sat 10am-7pm, in summer until 8pm; closed Sun; adm). The current building was begun in the 12th century and completed in the 15th The principal Northern French style façade, although incomplete has a magnificent rose window and 13th-century statues of saints, bishops and martyrs. The mystical gloom makes it difficult to see the magnificent Retablo de Santa Tecla on the high altar, a 1430 work by Pere Johan honouring Tarragona’s patron saint. Santa Tecla was converted by St Paul and followed him, dressed as a boy, and as the intricate carvings recount, she spent much of her life fighting off cads and miraculously escaping bizarre tortures.Other highlights include a starkly realistic 14th-century tomb of Archbishop Joan of Aragon, a Mudejar sacristy, and the beautiful 14th-century Gothic Chapel of Santa María de los Sastres (of the tailors). 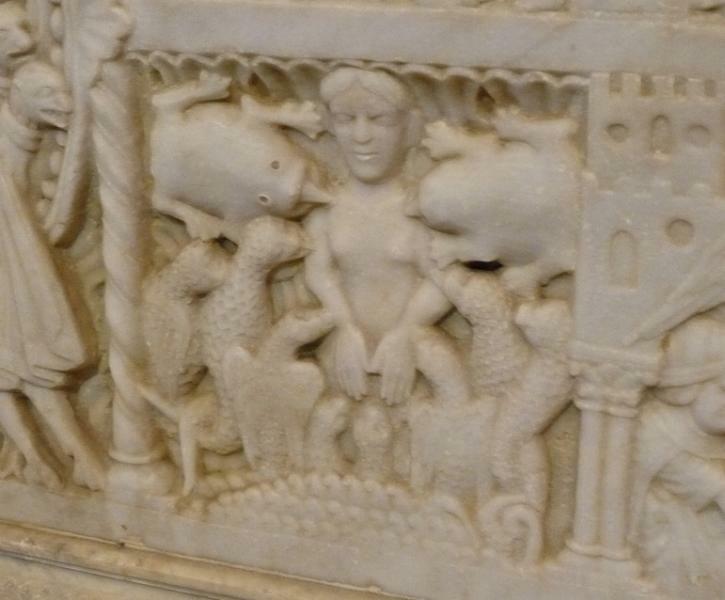 The enormous cloister is decorated with 12th-century sculpture that alone would make the trip to Tarragona worthwhile. Don’t miss the capital depicting scenes from the fable of the cat who feigns death to outsmart the mice hiding in the rafters. The jubilant mice descend to put puss on a funeral bier, only to face an unexpected feline resurrection. Note also the mihrab, the little niche in the wall oriented towards Mecca. What’s this doing here? It's a Tarragonese secret. Head back down the C/Major, turn left on to aristocratic C/Cavallers. At No.14, the Gothic Casa Castellarnau is now the Museu de la Historia de Tarragona (+34 977 220 242, closed at the time of writing) covering the medieval and later history of the city in rooms arranged a charming courtyard. Near the end of C/Cavallers, in the picturesque Plaça del Pallol, Gothic buildings were built over the western end of the huge Provincial Forum. One holds exhibits on Roman Tarragona, and the Maqueta Tarraco Romana, a complete architectural model of the ancient city (open Mon-Fri 9am-9pm, Sat 9am-7pm, Sun 9am-3pm, free). From here, pass through the walls at the Portal del Roser, one of the six city gates. Double axes and Iberian letters (ancient masons’ marks?) carved into the enormous lower blocks of the wall. Outside this gate begins the Passeig Arqueològic (Tue-Sat 9am-7pm, summer until 9pm, Sun 9am-3pm; adm), where through a manicured garden between the ancient and Baroque-era walls you can get the best view of the old works. The best part is near the Minerva Tower, with a bronze statue of Augustus, donated by Mussolini just before the outbreak of Civil War. Situated between old Tarragona and new, the Plaça de la Font is the closest thing this city has to a centre, ringed with tapas bars and restaurants where all Tarragona meets in the evening. The buildings on the southern side of this square are built over the vaults of the Roman circus. At the head of the square, the Ajuntament, a former Dominican monastery, conceals a surprise: Lluís Doménech i Montaner's colossal, over-the-top Tomb of Jaume I (1906). The great Catalan Count-king, unfortunately, isn’t in it. He was buried at the monastery of Poblet until the place was looted in 1835 and grave robbers left him lying in pieces on the floor. These found their way to Tarragona cathedral until Franco moved them back to Poblet in 1952, and now Doménech’s grand tomb sits empty here, waiting for some new count-king to fill it. From Plaça de la Font, head south across the Rambla Vella, and enter modern Tarragona, a sharp, elegant district with a touch of Modernista architecture from a century ago. The long, shady Rambla Nova links the Balcony of the Mediterranean with the grandiose Plaça Imperial Tarraco. Among the Modernista works here are Martorell’s Theresian Convent at C/Assalt (1922), and three early works by Tarragona’s own Modernista architect Josep Maria Pujol: the Teatre Metropol (1908), Casa Bofarull (1920) at C/Sant Agustí, and the Casa Aleu (1927) at C/Ixart. From this last, cross over the Rambla and head south on C/Cañellas for Pujol's grand Mercat Central (1919) and across Plaça Corsini, the striking Casa Porta Mercadé. A block south, behind the post office stand the columns and foundations of Tarraco’s Municipal Forum (open Tues-Sat 10am – 7pm; in summer until 9pm, Sun 10am–3pm; adm); the small part excavated includes a basilica, a bit of a temple and some adjacent streets and buildings. Carry on two streets to C/Caputxins for the scanty remains of the Roman Theatre, which was built into the hill overlooking the port— now 450m further out, thanks to silt from the little Francolí River. On the banks of the Francolí at Av. Ramón i Cajal, a gargantuan, shopping mall, Park Central, makes a noisy neighbour for the Palaeochristian Necropolis. After the burial of the bishop St Fructuosus in 259, this became a place of pilgrimage, before becoming overgrown and forgotten. The necropolis is the richest in Spain, producing funerary monuments and mosaics, from the pagan Romans to the Visigoths. The best artefacts are in the adjacent Palaeochristian Museum (+34 977 21 11 75 open June–Sept Tues–Sat 9.30am–1.30pm and 4–8pm, Sun 10am–2pm; Oct–May Tues–Sat 9.30am–1.30pm and 3–5.30pm, Sun 10am–2pm; adm). Other parts are, weirdly enough, on display in Park Central’s basement car park. You’ve already seen everything under the cliffs, looking down from the Balcony of the Mediterranean, including mile-long beach, the Platja del Miracle, along the main rail line for Barcelona. Behind the railway and just under the Balcony stands the 2nd-century AD Roman Amphitheatre (+34 977 24 25 79 open Tues–Sat 9am–7pm, in summer until 9pm; Sun 10am–3pm; adm) with seating for 14,000 bloodthirsty provincials. On the other side of the Renfe station sprawls Tarragona’s bustling port, where cargo ships share space with Catalonia’s biggest fishing fleet, ferries for the Balearics, and gin palace yachts. The port is closed off by Tarragona’s venerable fishermen’s quarter, El Serrallo, a dense urban neighbourhood now, dominated by Franco-era council blocks from the 1950’s, but there are plenty of good spots for seafood and tapas, and antique shops. 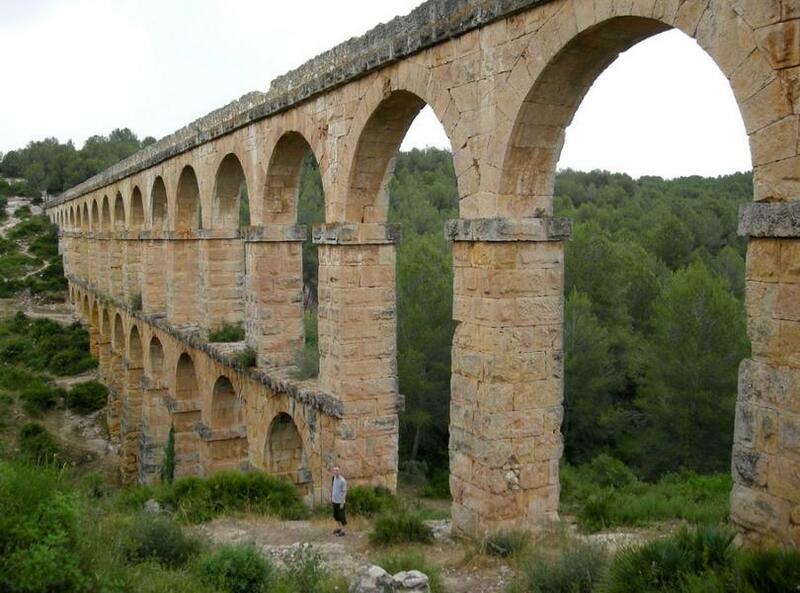 The Pont du Gard may be bigger, but Tarragona’s Aqüeducte de les Ferreres certainly makes an impression. This graceful beauty, one of three Tarraco built, supplied the city with water from the Francolí River (it’s on the N-240 to Lleida, 4km from the city). From the car park, pass through the gate – this land used to be the park of a wealthy family, and the gardens are slowly being rehabilitated. Follow the path for about five minutes and it will appear. The aqueduct's arcade, 85ft high and 817ft long, may have been the biggest expense, but the real art lies in what you can’t see: this aqueduct begins 25km away, and the channel that carries the water, most of it underground, has to keep a constant slope of precisely 0.04%. Arcades are necessary only when the aqueduct has to cross a valley. This one, lovely as it is, also provides a lesson in plain, no-nonsense Roman engineering. It's an hour and 15 minutes by train from Sants station to Tarragona.